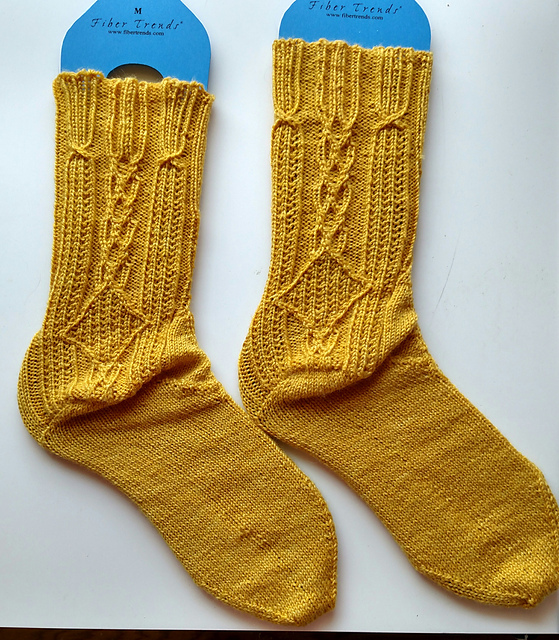 So…I realized I never finished posting about Tour de Sock and my ‘Summer of Socks’ plan, primarily because things got busy (as they usually do) and I was knitting things that can’t actually be talked about (the only downside to test knitting). But then I remembered it’d be December soon and I would definitely need things to post about so…hooray for filler! The fifth pattern for Tour de Sock had beads. I was not looking forward to this, as knitting with beads is super annoying and fiddly and the potential for certain cats (cough cough Rupert) to come along and tip over the container of beads, thus spilling them all over the floor, is always high. But I dutifully picked some yarn and went to the bead store that is located in convenient walking distance from my office, and got ready to play. And then the pattern dropped. First of all, it has beads that go down far enough that if one is wearing shoes, they will rub. How is this even remotely a good idea? Beads under the toe of a shoe are going to rub, and cause your socks to develop holes! Secondly, the pattern charts were all in eye-bleeding colors, using non-standard stitch notation that made it both a) super annoying to have to print (hint to pattern designers – not everyone has access to a color printer), and b) even *when* printed (either in color or in black and white), the colors were sometimes so dark that it was almost impossible to see the stitch notation in the first place. No surprise, I suppose, that there was a huge outburst of ‘are you *kidding* me?’ from a large majority of the other Tour de Sock participants – to the point where the organizer finally posted a ‘you don’t have to do the bottom half of the beads’ note, plus the next sock pattern was apparently then hastily modified to include no color at all on the charts (despite it being a colorwork pattern, where using color actually makes sense….but more on that later because I have to have *something* to write about for tomorrow!). After all of that, of course, since I am a super fast knitter, I ended up doing all the damn beads anyway – primarily because by the time I *saw* the ‘you don’t have to do the bottom half of the beads’ comment, it was too late – I’d already done them on the first sock, and I wasn’t about to have non-matching socks so I grit my teeth and did them for the second one as well. Here they are. 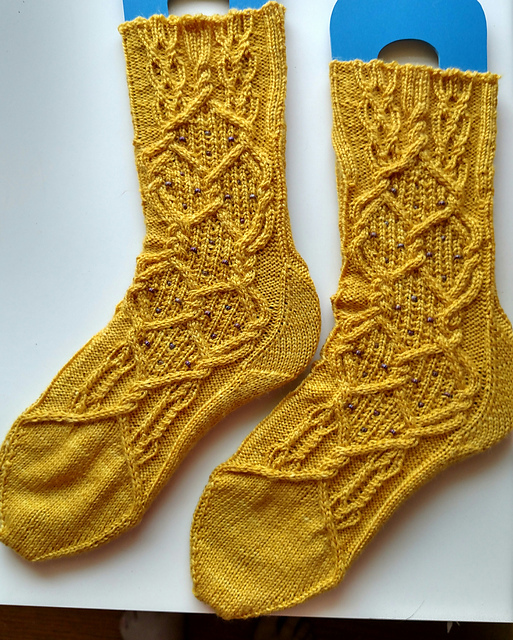 If it weren’t for the beads, I would really love these socks, because I do love me some cables, and this pattern is *all* about the cables. The designer has a plethora of other patterns available, so apparently there are enough people out there who don’t mind reading from eye-bleeding color charts and using beads on their socks to make it worth her while, but I suspect that if I ever do another of her patterns, I’ll take the time to re-chart them first. And (short of another Tour de Sock pattern in the future), I can’t see myself ever voluntarily adding beads to a sock again, because seriously, no. Just…no. What a gorgeous pattern! I am always in admiration of people who can knit. I tried for years and was hopeless at it…except for one baby blanket. So cute! I’m not crafty enough to even attempt to learn to knit.